I like getting things done standing up and moving around. So, I repurposed the rolling cat house. When Fezzle saw me making changes, he jumped in to make sure I wouldn't remove his basket. He saw me eyeing that space. So, I can truely say that he helped design this desk. Now he can go to sleep knowing he'll be with me when he wakes - - where ever the desk may be. The desk wasn't quite tall enough so I put a wire in-box upside down and connected the front edge with cable ties so it hinges for easy access and storage of wires. 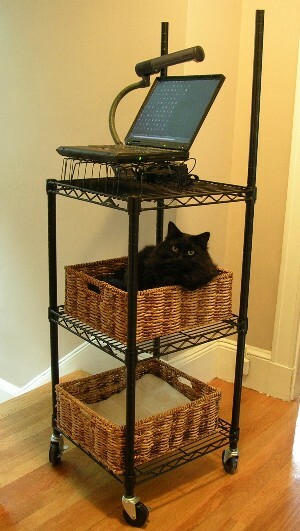 The LRF** support of the wire basket keeps the ThinkPad secure. The great thing about this desk is that it's so easy to customize and personalize. I may add a shelf on the two tall poles for speakers. 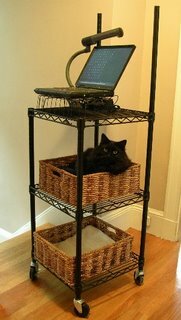 I don't think Fezzle would allow me to put a subwoofer on that bottom shelf. He thinks it has something to do with dogs. So, for now it's a work in progress, but does the job well. And it helps me think on my feet. Were the spirit of justice and humanity to pervade this country, we could not be easily driven into war."